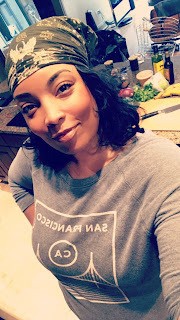 I hope everybody had a fantastic Thanksgiving holiday! 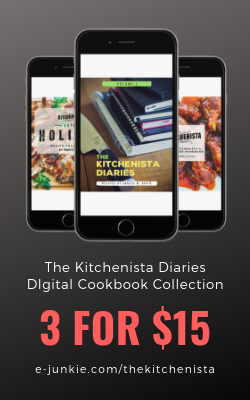 Gotta say I was really touched by all of the positive feedback from those of you who made recipes from my Thanksgiving eBook and blog posts. (The Classic Mac & Cheese recipe has officially been dubbed Crack & Cheese, if that's any indication as to the popularity of that post as this point!) My family's Thanksgiving dinner was excellent, in my opinion our best ever. We smoked two spatchcocked turkeys, so that departure from tradition gave me a window to spice up our menu much more than I've been able to do in previous years. Besides the turkey, highlights for me were the cornbread and andouille dressing, a savory spicy blood orange cranberry sauce and a cranberry pear pie! I've added all of the pics from the day to a public album if you'd like to see the whole spread! Now that we're into "use up all the leftovers" mode, I thought I'd go ahead and share a recipe for an appetizer that turned out to be the sleeper hit. 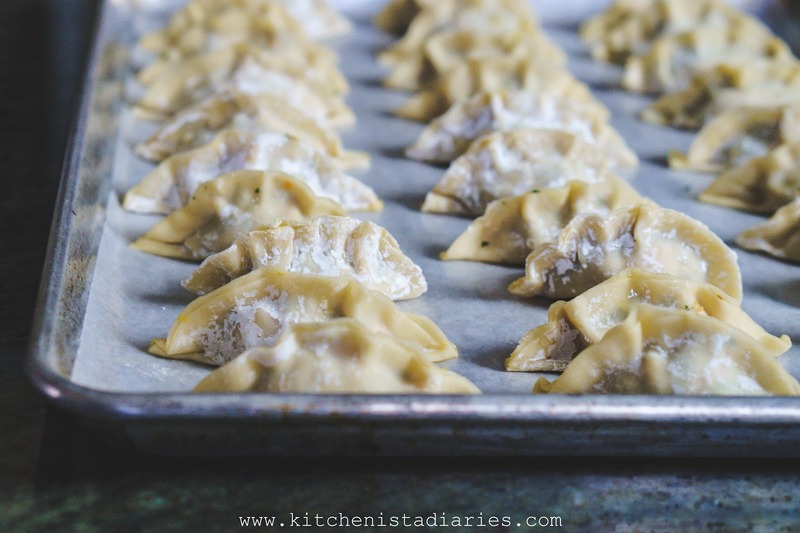 I made these sausage stuffed pot stickers on a whim while doing my Thanksgiving prep, froze them, and ran out of time to cook them on Thanksgiving! We had plenty of food so it wasn't a big deal, nor did anybody know they were stashed in our freezer. 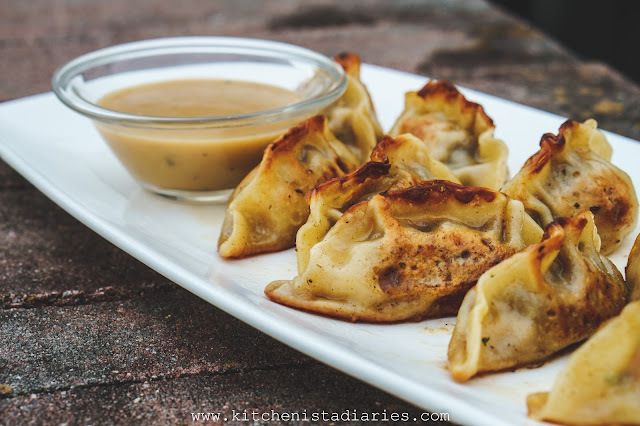 I ended up holding off and saved the pot stickers as a surprise appetizer last night. They were gobbled up immediately, so it's safe to say they'll be part of the "official" menu next year! The pot stickers are totally flexible, so it's definitely a recipe to use up whatever's left in the fridge. 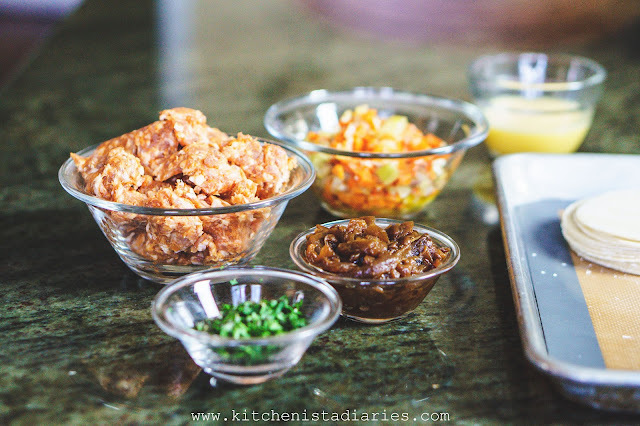 I did this batch with uncooked ground sausage but you could certainly chop up bits of cooked turkey or ham if you have leftover Thanksgiving meat. 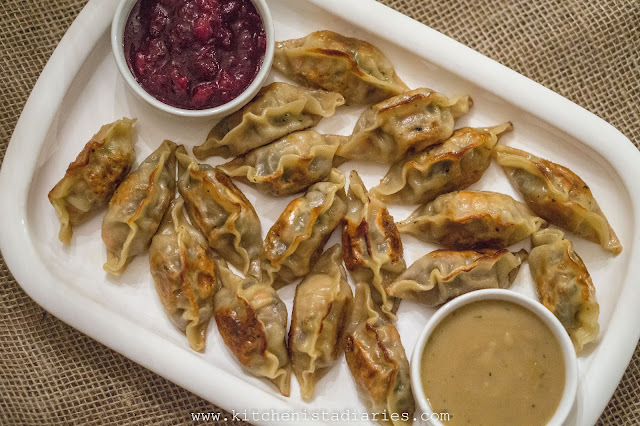 Serve with extra gravy and/or cranberry sauce and you've got yourself a crowd pleaser! 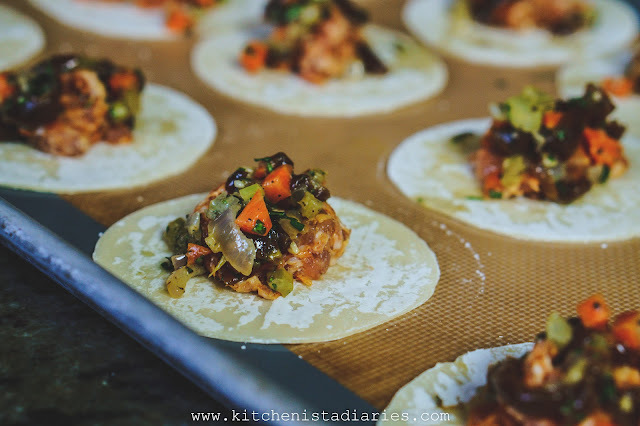 *If you don't already have caramelized onions on hand, just use freshly diced onions and cook with the celery and carrots in the first step of the recipe. In your skillet, add one tablespoon of butter and cook the celery, carrots, garlic and chile flakes just until softened, about 5 minutes. Season to taste with salt and pepper. Remove and set aside to cool. Combine the cooked veggies, herbs and caramelized onions in a small bowl. 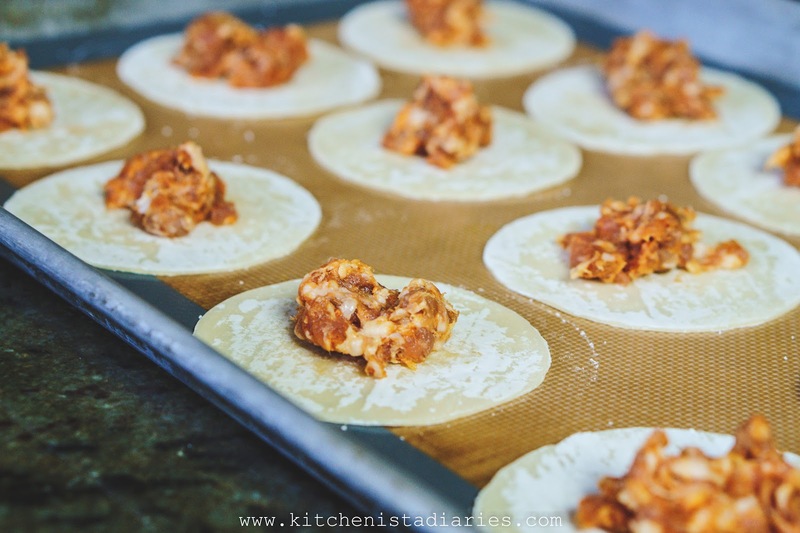 Remove the ground sausage from its casing if necessary, or if using leftover cooked meat mince it finely. In a separate bowl, beat the egg with a teaspoon of water until frothy. 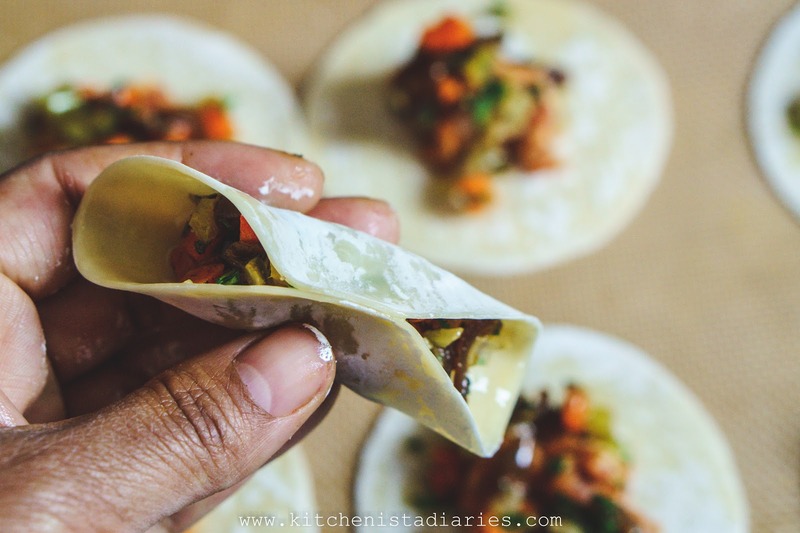 Get out your package of pot sticker wraps. It's easier to work with a handful at a time and keep a damp cloth over the rest, to prevent them from drying out. Spread out a few pot sticker wraps on a lined baking sheet. Top with a tablespoon of sausage. Add a small spoonful of the veggie and herb mixture. Dip your finger in the egg wash and paint it around the edge of one pot sticker wrap. 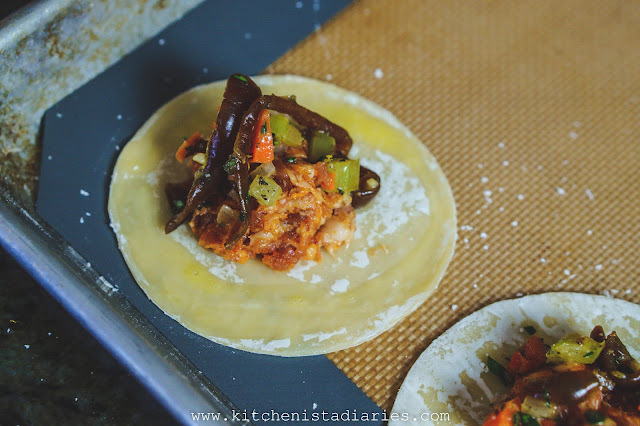 Then pinch the pot sticker wrap at the top and sides, and use your fingers to crimp the edges. You can get as fancy as you want, or not. I was working with a toddler on my hip, so we went with NOT. Just make sure the pot stickers are all sealed. You'll get into a groove after a few and figure out how to pinch them shut consistently. As you close all the pot stickers, arrange them on the baking sheet. 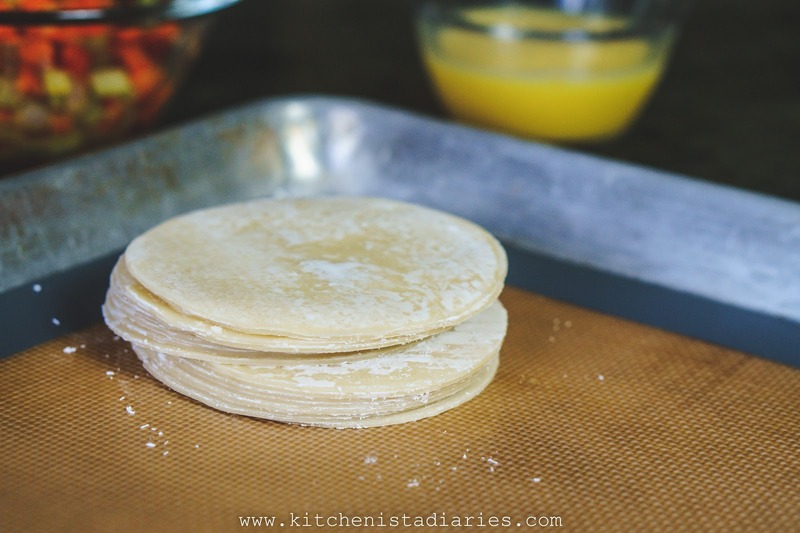 They'll stand upright if you press the bottoms flat against the baking sheet. Continue until all of the wrappers are filled or you run out of filling! 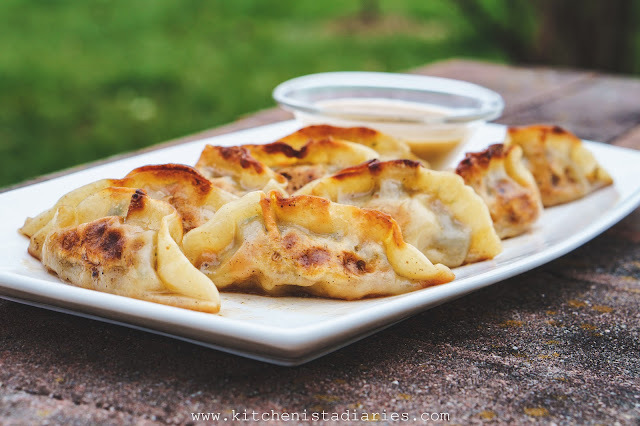 Once you have a whole tray of pot stickers done, you can cook them immediately or freeze until needed. If freezing, leave them on the lined baking sheet. Freeze for an hour or until they feel solid and then you can transfer them to a freezer bag. They won't stick together this way. You don't need to thaw at all before cooking. 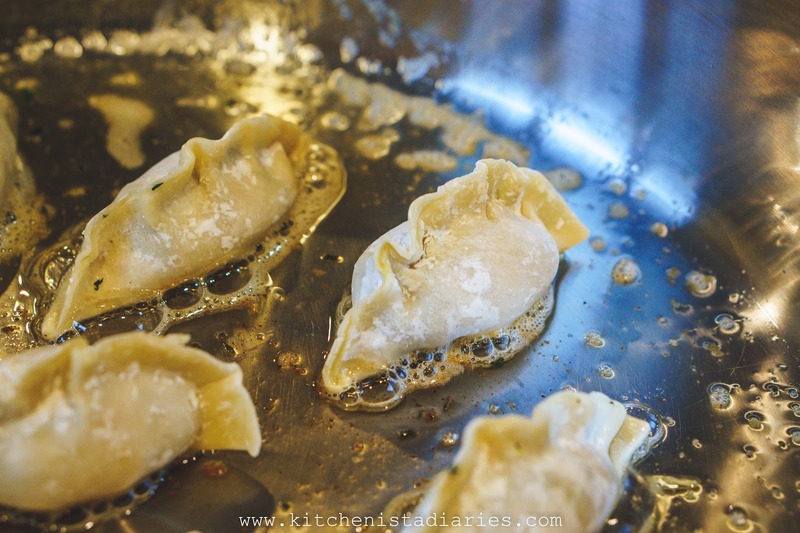 To cook the pot stickers, heat the remaining butter and cooking oil over medium high heat. Once sizzling, add the pot stickers so they're standing upright. Cook for a few minutes, until the pot stickers are browned nicely on the bottoms. Turn them over on their sides and cook another couple minutes. Then flip them over to the opposite side and brown for a couple minutes. 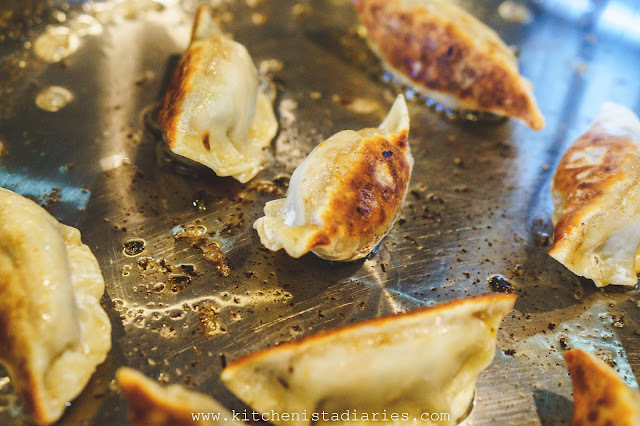 You won't get as hard of a sear on the sides of the pot stickers, but you should see spots of brown where they came into contact with the pan. 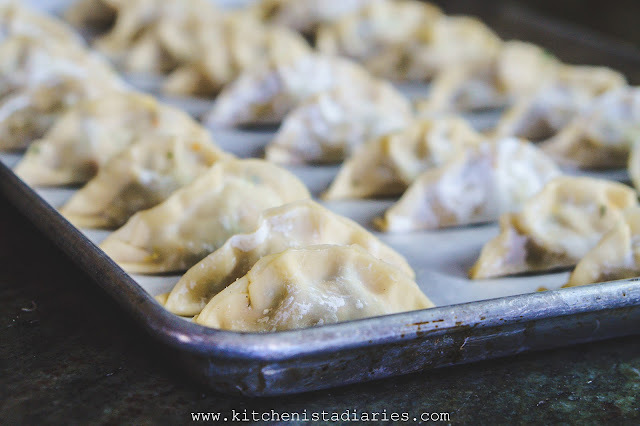 Once all the sides are browned, stand the pot stickers back upright. Pour in the stock. It will immediately bubble up in the hot pan. 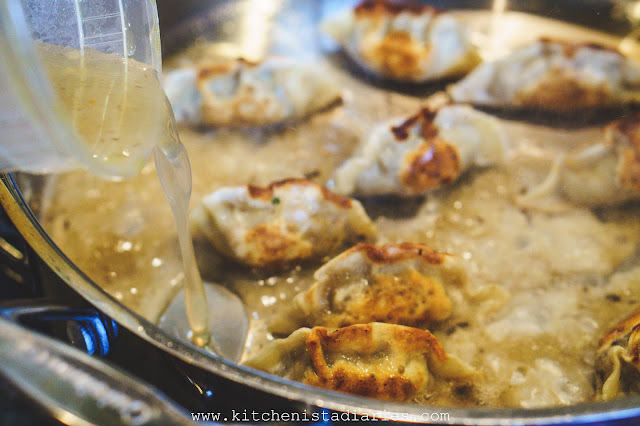 Close the lid and allow the pot stickers to steam for a couple minutes to ensure that the sausage is cooked through. You can slice one open to check that the sausage is cooked, especially if they were frozen - but trust me, they don't take long at all to cook. After steaming the pot sticker wrapper takes on a softer, doughy texture which contrasts nicely with the crispy bottoms. Carefully remove the pot stickers from the pan. I found it helpful to gently slide a thin spatula or my tongs underneath the ones that stuck a little more, but most of them slid right out once nudged. 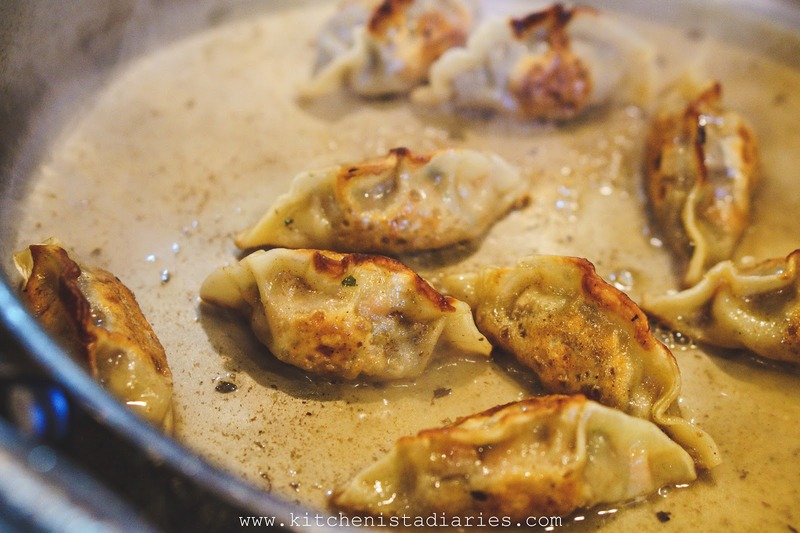 Transfer the cooked pot stickers to the pan and serve with warmed gravy. Cranberry sauce also works really well! Side note - I didn't need the liquid left in pan, but if you didn't have any other dipping sauce, it could easily be thickened up with a little cornstarch whisked in to make a quick gravy, perhaps with a splash of soy sauce for flavor. Have fun making these your own! !